TEA PARTY BILLBOARD COMPARES OBAMA POLITICS TO LENIN AND HITLER……. – The Tundra Tabloids……. 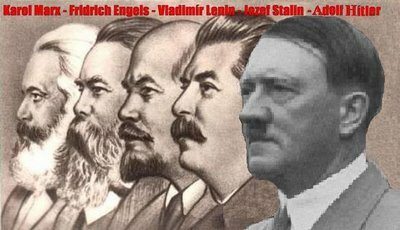 TEA PARTY BILLBOARD COMPARES OBAMA POLITICS TO LENIN AND HITLER……. The Tundra Tabloids thinks that the billboard is spot on, the man isn’t calling him a mass murderer, but a fellow traveller of the same ideology that both late dictator’s espoused. Interestingly enough, at least according to the article, the complaints filed against the billboard are expressing outrage for comparing/linking Obama to Hitler, but not with Lenin, whose own version of Marxist socialism murdered far more people than Hitler’s version of Marxist socialism. DES MOINES, Iowa – A billboard created by an Iowa tea party group that compares President Barack Obama to Adolf Hitler and Vladimir Lenin is drawing sharp criticism — even from fellow tea party activistswho have condemned it as offensive and a waste of money. The co-founder of the roughly 200-person group said the billboard was intended to send an anti-socialist message. But Bob Johnson admitted Tuesday that the message may have gotten lost amid the images of fascist and communist leaders. “The purpose of the billboard was to draw attention to the socialism. It seems to have been lost in the visuals,” Johnson said. “The pictures overwhelmed the message. The message is socialism.” He said he didn’t know of any plans to remove the sign. Previous Post Previous Post FOX NEWS’ MEGAN KELLY DEBATES A LIB AIR HEAD……. Next Post Next Post ISLAMIZATION OF NY: MUSLIMS SEEK TO ADD ISLAMIC HOLIDAYS TO SCHOOL YEAR CALENDAR……. The german socialists, communists and social democrats were THE ONLY ONES who opposed the nazis, they were persecuted, murdered and sent to concentration camps. Nazism is fascism + racial supremacy. Nothing of this has anything to do with socialism. Fascism is an extreme reactionary movement, with popular support (populist) created by the ruling classes to oppose modernity, liberalism and socialism.